Anti-clericalism is a historical movement that opposes religious institutional power and influence in public and political life. In its more extreme manifestations, anti-clericalism has led to violent attacks against the clergy, vandalism against religious sites, and the seizure of church property. Often directed against the Catholic Church and clergy, anti-clericalism goes beyond mere secularism or the French tradition of laïcité, which advocates both the absence of religious interference in government affairs and government interference in religious affairs. The goal of anti-clericalism is often that religion should become a strictly private activity. Although anti-clericalism in one form or another has existed through most of Christian history, it became a major force underlying the sixteenth century Protestant Reformation. During the Enlightenment, philosophers such as Voltaire bitterly attacked the alleged moral corruption of the Catholic Church, a factor playing a major part in the wholesale attacks on the very existence of the Church during the French Revolution. In the late nineteenth and early twentieth centuries, anti-clericalism played an important role in the politics of several predominantly Catholic countries, such as France, Mexico, Spain, and Portugal. Anti-clericalism also came to the fore during the Russian Revolution and other Communist revolts, which viewed religion itself as an agent of capitalism as well as opposing belief in God on philosophical grounds. Communist regimes engaged in the violent repression and assassination of clergy, including Orthodox, Buddhist, Muslim, Catholic, and Jewish, religious leaders. Although the term anti-clericalism normally applies to later movements, the phenomenon of popular resentment and violence toward Church authority became prevalent from the twelfth century onward. The Italian monk Arnold of Brescia (d. 1155) called on the Catholic church to renounce ownership of property and led the Commune of Rome's temporary overthrow of papal rule. The Waldensians likewise urged the church to return to the ideal of poverty. In the next century, extremist groups among the Spiritual Franciscans such as the Dulcinians and Brethren of the Free Spirit not only argued that apostolic poverty be practiced by the entire clergy, but physically attacked the palaces of wealthy bishops, destroying property and killing some in the process. Criticism of clerical corruption continued to be an important theme in reformist movements up to and including the Protestant Reformation. Martin Luther found it necessary to distance himself from the Peasants' Revolt which had taken his own bitter attacks on the Catholic hierarchy to the point of rebellion not only against the Church, but the feudal order as well. Protestant propaganda against "papism" and clerical corruption during the Reformation laid the foundation for later anti-clerical ideology. Anti-clericalism became particularly virulent during the French Revolution. Eighteenth century writers such as Voltaire and the Encyclopedists wrote biting critiques and satires exposing priestly corruption and the excesses of Catholic institutional power. 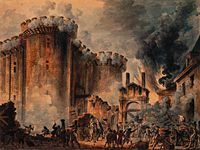 This intellectual movement bore fruit in the French Revolution's direct assault on the privileges of the Catholic Church, including the state's confiscation of Church property, the execution of anti-revolutionary churchmen, and mob actions inflicting severe damage to Catholic shrines and art. Under the Ancien Régime, the Church had been the largest landowner in the country. The revolutionary government seized the property of the Church, through the law of December 2, 1789. Further legislation abolished monastic vows. Soon, the Civil Constitution of the Clergy made the Catholic Church an arm of the state and turned the remaining clergy into state employees, requiring them to take a loyalty oath. The pope, however, rejected the principle of priests swearing an oath to the state rather than the Church, leading to a schism between those clergy who took the oath and those who refused. The ensuing years saw violent repression of the clergy, including the imprisonment and massacre of priests throughout France. Napoleon Bonaparte reestablished the Church's rights in 1801, but under terms which made the Church clearly subservient to the state. Anti-clericalism is particularly discussed in the context of the French Third Republic (1871-1940) and its struggle with the Roman Catholic Church. Prior to 1905, the restored Catholic Church in France still enjoyed preferential treatment from the French state, along with the Jewish, Lutheran, and Calvinist minority religions. During the nineteenth century, priests were employed as teachers in public schools, where the Catholic religion was also taught. Teachers were obliged to lead the class to Mass. During the 1880s, Jules Ferry, then minister of education, began to expel priests and nuns from public schools, dismissing approximately 5,000 on November 29, 1880. In 1881-1882, his government passed the so-called "Jules Ferry laws," establishing universal free education in 1881 and mandatory and lay education (1882), providing the basis of modern French public education. These laws were a crucial step in the secularist foundation of the maturing Third Republic, which had previously been dominated by the Catholic Legitimists who hoped for a return to the Ancien Régime. A 1905 law on secularism was enacted by the government of Radical-Socialist Émile Combes, meeting violent protests by the clergy and their supporters. Most Catholic schools and educational foundations were closed, and many religious orders were dissolved. 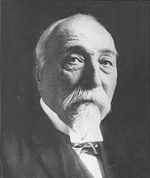 In the Affaire Des Fiches (1904-1905), it was discovered that the militantly anti-clerical war minister, General Louis André, was determining promotions based on a file on public officials, detailing which were Catholic and, among these, who attended Mass. French Republican anti-clericalism softened after the First World War, as even Catholics began to accept secularism as long as it guaranteed freedom of religion and equal rights for their church. Anti-clericalism is still present in France today, however, especially among the French left wing. In addition, the issue of private schools in France, which are often Catholic and whose professors are paid by the state, remains a sensitive issue in French politics. A first wave of anti-clericalism occurred in Portugal in 1834 when, under the government of Dom Pedro, all convents and monasteries in Portugal were abolished, simultaneously closing many of Portugal's Catholic-run primary educational establishments. The fall of the monarchy in the Republican revolution of 1910 led to another wave of anti-clerical activity. Most church property was placed under state control, and the Church was not allowed to inherit property from private donors. The wearing of religious garb and religious instruction in schools were also abolished. Anti-clerical violence in Spain arose during the First Spanish Civil War (1820-1823). During riots in Catalunya, 20 clergymen were killed by members of the liberal movement in retaliation for the Church's siding with absolutist supporters of Ferdinand VII. In 1836, following the First Carlist War, the new regime abolished the major Spanish convents and monasteries. The Radical Alejandro Lerroux distinguished himself by his inflammatory anti-clerical writing. During the Spanish Civil War of the 1930s, and in the context of atrocities on both sides, many of the Republican forces were violently anti-clerical anarchists and Communists. The numerous assaults against Catholic institutions, clergy, and supporters during this period have been been termed Spain's Red Terror. These included the sacking and burning of monasteries and churches and killing 283 nuns and more than 6,000 priests, including 13 bishops, 4184 diocesan priests, 2365 members of male religious orders. Among these were 259 Claretians, 226 Franciscans, 204 Piarists, 176 Brothers of Mary, 165 Christian Brothers, 155 Augustinians, 132 Dominicans, and 114 Jesuits. There are accounts of the Catholic faithful being forced to swallow rosary beads, thrown down mine shafts, and priests being forced to dig their own graves before being buried alive. The Catholic Church has canonized several martyrs of the Spanish Civil War and has beatified hundreds more. Anti-clericalism in Italy is connected with the reaction against the absolutism of the Papal States, which were overthrown in 1870. For many years, the popes required Catholics not to participate in the public life of the Kingdom of Italy, which had invaded and conquered the Papal States to complete the unification of Italy, leaving the pope confined to Vatican City. 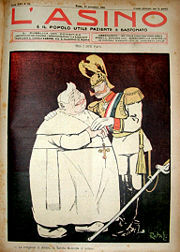 Italian cartoon showing Pope Pius X crying to Kaiser Wilhelm II, 1907. The hostility between the Holy See and the Italian state was finally settled by fascist dictator Benito Mussolini, who sought an agreement with the Church to gain its support. The so-called Lateran treaties were finalized in 1929. The agreements created Vatican City as a fully independent sovereignty under the Holy See. The pope pledged perpetual neutrality in international relations and to refrain from mediation in controversies unless specifically requested by all parties. The concordat established Catholicism as the official religion of Italy, and a financial payment was accepted settling the claims of the Holy See against Italy due to the loss of its temporal power and lands in 1870. After World War II, anti-clericalism was embodied by the communist and socialist parties, in opposition to the Vatican-endorsed Christian Democracy in Italy. The revision of the Lateran treaties in the 1980s by the socialist prime minister of Italy Bettino Craxi removed the Catholic Church's status as "official religion" of Italy but still granted a series of provisions in favor of the Church, state financial support of the Church, the teaching of the Catholic religion in schools, and other privileges. Recently, the Catholic Church has been taking a more active stance in Italian politics. Anti-clericalism is rejected by the Italian political parties, with the exception of the Italian Radicals, who, identify themselves as laicist. In Germany, Chancellor Otto von Bismarck championed liberal ideology and began the Kulturkampf against Roman Catholicism, in 1871. A series of anti-clerical laws were passed, the Jesuits were banned and a number of other Catholic religious orders were restricted. State authorities removed resistant priests from their parishes and several bishops were deposed. Although most of this legislation was repealed before the end of the century, the state continued to favor liberal Protestant cultural and intellectual institutions. The ban against the Jesuits was not repealed until 1917. Anti-clericalism became state policy in Mexico following the revolution of 1860, when President Benito Juárez issued a decree nationalizing church property, separating church and state, and suppressing religious orders. After the revolution of 1910, the New Mexican Constitution of 1917 contained even more drastic anti-clerical provisions. Article 3 called for secular education in the schools and prohibited the Catholic Church from engaging in primary education; Article 5 outlawed monastic orders; Article 24 forbade public worship outside the confines of churches; and Article 27 placed restrictions on the right of religious organizations to hold property. Most obnoxious to Catholics was Article 130, which deprived clergy members of basic political rights. Many of these laws were resisted, leading to the Cristero Rebellion, of 1927-1929, initiated under the administration of President Plutarco Elías Calles. The repression of the Catholic Church included the closing of many churches even the killing and forced marriage of priests. The persecution was most severe in Tabasco, under the strident atheist governor Tomás Garrido Canabal. The effects of the war on the Church were profound. While there were 4,500 active priests before the rebellion, in 1934 only 334 priests were licensed by the government to serve 15 million people, the rest having been eliminated by emigration, expulsion, assassination, and attrition. As many as 10 states were left without even a single priest. Between 1926 and 1934, at least 40 priests were killed. Elsewhere, in Latin America, anticlerical laws were passed and enforced in Columbia from 1849–84, but were then repealed in 1888. In Venezuela, the Catholic Church was severely repressed under the government of Antonio Guzmán Blanco (1870–88), and anticlerical policies remained in force for decades afterward. Most Communist governments have been officially anti-clerical, abolishing religious holidays, teaching atheism in schools, closing monasteries, religious educational institutions, and many churches. In the USSR, anti-clericalism was expressed through an official state policy of militant atheism. Both Orthodox and Catholic priests came to be seen as agents of the old capitalist order, as did many Hasidic rabbis and Muslim imams. During the Lenin era, mass executions of religious believers and priests were reported during the Red Terror, and large churches were turned into "museums of atheism." Many thousands of priests, monks, and other clergy were either executed or sent to forced-labor camps to die during the Stalin era. In the USSR and Eastern Europe, a grudging peace eventually emerged as compliant clergy, especially in the Orthodox churches, cooperated with the state's socialistic and secularist policies, while others were forced underground. In China, Catholic priests, Protestant missionaries, and Buddhist clergy in Tibet faced severe persecution. In North Korea, the clergy also suffered, especially Protestant ministers, who had formerly succeeded in winning for Pyongyang the nickname "Jerusalem of the East." Even after the end of the Stalin era, regimes such as Enver Hoxha's Albania continued to attempt to abolish all religion. In Poland, the struggle between state anti-clericalism and the Catholic Church produced severe tensions in the strongly Catholic country, a major factor in the rise of Solidarity movement and the ultimate collapse of the Soviet empire. Today, traditional militant anti-clericalism tends to be less common. In Western democratic nations, this is largely due to states recognizing freedom of religion and hence being disinclined to interfere in religious matters. Many states which engaged in anti-clericalism are now constitutionally prohibited from meddling in internal Church affairs or abridging the free exercise of religion. 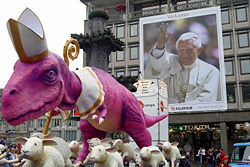 In addition, the Roman Catholic Church itself has adopted a more liberal policy in relation to the state, contributing to a decline in anti-clericalism. In some countries a new form of anti-clericalism has recently arisen, focused on Islam. An anti-clericalist party in Israel is Shinui, which actively opposes the presence of rabbis in Israel's political structure, on the grounds that the Orthodox parties have influenced Israeli laws in ways which many Israelis find objectionable. The French tradition of laicite continues to receive criticism, not only in terms of anti-clericalism directed against Catholics, but especially against newer and smaller religious groups. In Canada, anti-clerical waves have been noted in Quebec since 1960, and in Northern Ireland, anti-clericalism against Catholics, though diminishing, is still prominent. Beevor, Antony, and Antony Beevor. The Battle for Spain: The Spanish Civil War, 1936-1939. New York: Penguin Books, 2006. ISBN 9780143037651. Bertocci, Philip A. Jules Simon: Republican Anticlericalism and Cultural Politics in France, 1848-1886. Columbia: University of Missouri Press, 1978. ISBN 978-0826202390. Butler, Matthew. Faith and Impiety in Revolutionary Mexico. New York: Palgrave Macmillan, 2007. ISBN 9781403983817. Dykema, Peter A., and Oberman, Heiko A. Anticlericalism in Late Medieval and Early Modern Europe. New York: E.J. Brill. 1963. ISBN 978-9004095182. Sanchez, Jose M. Anticlericalism: A Brief History. Notre Dame, Ind. : University of Notre Dame Press, 1972. ISBN 978-0268004712. This page was last modified on 30 September 2008, at 16:11.